Uglyworld #2115 - Olympics Birdies Nest - (Project Cinko Time - Image 314-365), a photo by www.bazpics.com on Flickr. I'm sures that I doesn't need to even tries to explainers where I visitereds today to you alls, I'm certains that you already knowers it immediatelies! 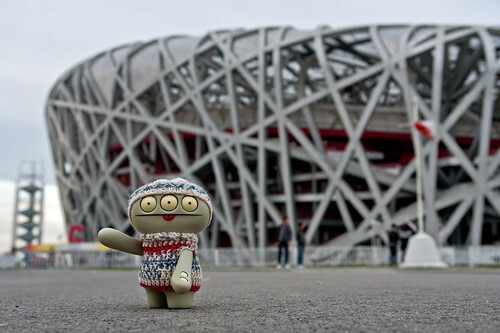 Wowzers, whats a stadium they makereds here for the Beijings olympics, the massivers birdies nest looks so super cools, and when you walkers down the olympics avenue and sees all of the other buildings they makereds too likes the watery building which was usereds for swimmings, I has to says it agains, wowzers! To makes it a propers olympic days out, I challengers Baz to races me overs a distancer of arounds one hundreds meters, naturallies with me beings the littlers guy I gettereds a heads start, and while Baz was complainerings about that tieds his shoelacers together, enablerings me to beaters him with one flipper tieds behind my back, woohoo! Yes, you heareds me rights, Cinko is your new olympics championer!